Toronto Mayor Rob Ford's office is responding after a photo of him posing with a neo-Nazi was posted online. The image of Ford posing with Jon Latvis is making headlines after appearing Thursday on the blog of Sun commentator, and former Liberal candidate and strategist, Warren Kinsella. Kinsella posed the question: "Why is Toronto’s mayor pals with a former neo-Nazi icon?" Latvis was a member of the neo-Nazi band RAHOWA (Racial Holy War), according to Kinsella and various web posts. The photo first appeared on the Web on May 6 on a Facebook page in Latvis' name, according to the Toronto Sun. The caption? 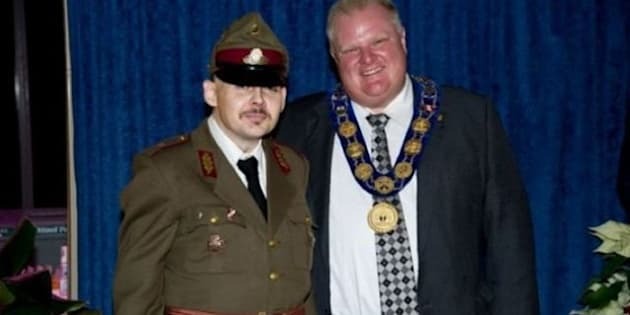 "Me meeting with Toronto’s Mayor, Rob Ford to get an endorsement for the Latvian Homeguard — at Toronto City Hall." After the photo appeared on Kinsella's site it began to go viral on Twitter. By Thursday afternoon Rob Ford was a trending topic. Ford's office, however, is not letting the image spread without explanation. In a statement, the mayor's office states the image was captured at the 2012 New Year's Levee at Toronto City Hall, an event where Ford typically poses with between 700 and 750 people. The man, who did not identify himself as Jon Latvis, according to the mayor's office, asked for a future meeting with the mayor. Ford gave him that meeting, where the man in question expressed concerns "primarily focused on transit issues." The chat took place in March of this year. When the photo showed up on Kinsella's blog Thursday the mayor's staff recognized Latvis. "At no time was the Mayor aware of allegations that this individual had made racist, hateful or otherwise offensive comments, nor were any such comments made during his meeting," the statement reads. "Mayor Ford is a strong supporter of Toronto's Jewish community and strongly deplores anti-Semitism in any form." Twitter users were not entirely convinced of the explanation, questioning whether the photo is part of a wider trend involving the mayor's lack of participation in Pride events in Toronto and his recent comments on "hug-a-thug" programs and banishing those convicted of gun crimes in the wake of the mass shooting in Scarborough. Others questioned why the mayor failed to make the connection between the man's uniform and his beliefs. Whatever happened between the two men, the photo can't help but hurt Ford's already tarnished public image. From calling 911 on a reporter and comedian to publicly failing to reach his weight-loss goals, not to mention a half-dozen other minor scandals, Toronto's mayor hasn't exactly had an easy few years in office. Maybe things can only look up from here. CORRECTION: A previous version of this story incorrectly spelled Latvis' first name John. The Facebook page where the image was originally published identifies him as Jon.